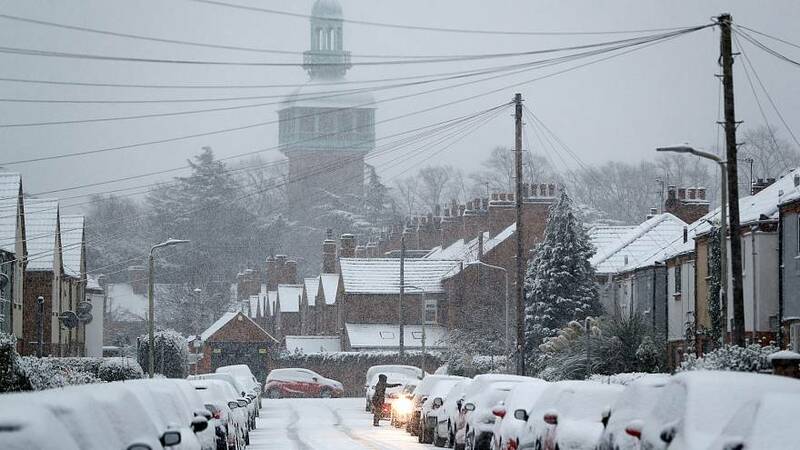 The worst snowstorms in years hit Britain over the weekend, closing roads, grounding flights and leaving thousands without power. An "amber weather warning" was issued across large parts of the UK, particularly central England and north Wales. The Met Office warned travellers that "road, rail and air travel delays are likely, as well as stranding of vehicles and public transport cancellations". Flights were suspended at Birmingham, London Stansted and Luton airports while runways were cleared. Trains were cancelled and some motorways almost ground to a halt due to the icy conditions. A ferry carrying 200 passengers ran aground in the French harbour of Calais due to stormy weather. There were no injuries, but all cross-channel traffic was interrupted. Nearly 30 centimetres of snow fell on Sennybridge in Wales, and 12 cm just outside London. The Met Office says ice is likely to be the "main hazard" overnight and into Monday morning. People were urged not to take their car unless absolutely necessary. It wasn't all bad news for everyone though, as many - both children and adults - saw in the weather a rare chance for snow fights and sledding down hills.